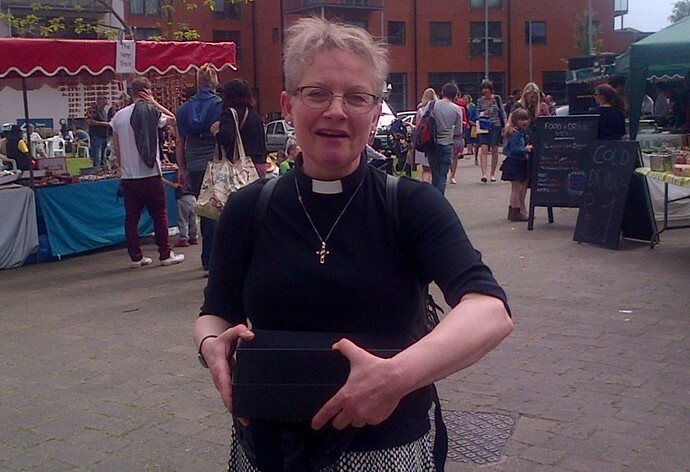 This coming Sunday 8th January will be the Reverend Jane Kustner’s final service at St Swithun’s, Hither Green Lane. Jane is off to Marianridge Natal Province in South Africa. Fun and compassionate, Rev. Jane has been a rock for many local people- supporting us through christenings, marriages, illness and funerals… even providing room for people to stay. Jane has over seen the restoration of St Swithuns’ West Window (facing onto HGL) and helped save the now renovated Church Hall. She has turned St Swithun’s into a true hub of this community, opening the buildings up to musicians, artists, dancers, actors, children, the elderly … The HGCA has hosted countless events there over the past 9 years. Jane deserves a HUGE send off and everyone is invited to come and say goodbye. Join her 10am this coming Sunday, or if that’s too early, come along to her leaving party/ hog roast at the Church from 12noon. Everyone is welcome- a reflection of her truly inclusive, arms open approach to her ministry in Hither Green.